« Usually we said that an artist declines all his life the same « obsession », which is found through its works in plastic manner or set of themes. Of course, there is truth in this commonplace, but it is true also that these variations can infinitely rich and be varied. If we finds typically signed « concerns » and « keys » Johanna Vaude, its films remain quite distinct the ones from the others while playing the game of the correspondences, only « obsession » common and visible to date for me would be the dash of the heart. « Self-portrait and the world » (1997), the title of its first film (apart from « Bim bam scratch pfuiiiiii » and « Essai on the body » that it still considers as tests) positions already the filmaker at the advanced station of observant of the world from an artistic point of view. From this film, Johanna Vaude will not have from cease to want to share its sights, or more precisely its visions, with us, spectators. The eye and the glance, variation of the self-portrait, become a central and recurring figure, the expression of a shared interiority. In its films, the glance proposes but does not impose, the character looks at and observes initially (« The wild Eye » and « Our Icare ») for then further leaving, towards elsewhere who always pushes us to the top, the glance opens and invites beyond a simple point of view or of a simple standpoint. These other worlds are not simply creepage distances but many ways intimate that everyone can follow if it has the desire of it. Johanna Vaude does not expose great theories on freedom, its cinema is much more impulsive and emotional, free and generous, it touches with the desire and declines the reason for imaginary saving which makes it possible to exceed our condition of social man and makes it possible this one to rise, to be released. The majority of her films are settings in images of its own dreams or visions, this is why the imaginary door give the key of the creativity, life. In « The wild Eye » (1998), the voyage is interior and deeply sentimental, slowly it takes us along in a world unknown and deep, the colors vary at the rate/rhythm of the hypnotic tempo. In « Our Icare » (2001), Johanna Vaude tackles the violence of the world and opposes it to imaginary, saving of course, but before very mythical and symbolic system, one passes here to a more political matter. (…) The structure of film is very simple, there are three quite distinct parts, but the matter remains ambiguous: « (…) I do not show if Icare falls or not, and it is voluntary. That is to say the spectator the analysis like one learned to him: Icare falls; either it sees it differently, and it is my hope ». 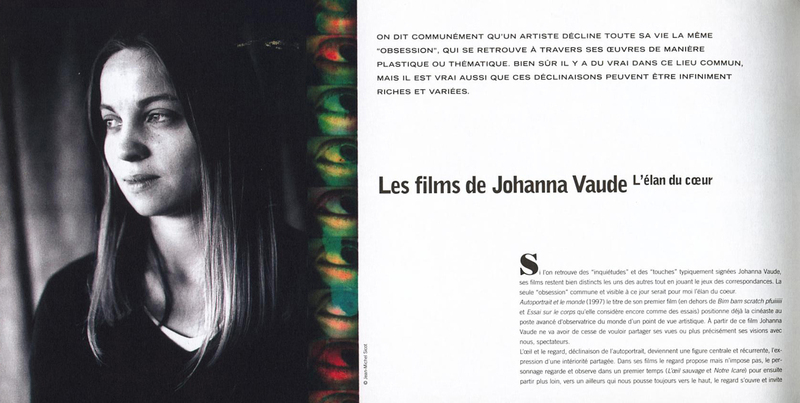 « Johanna Vaude’films. 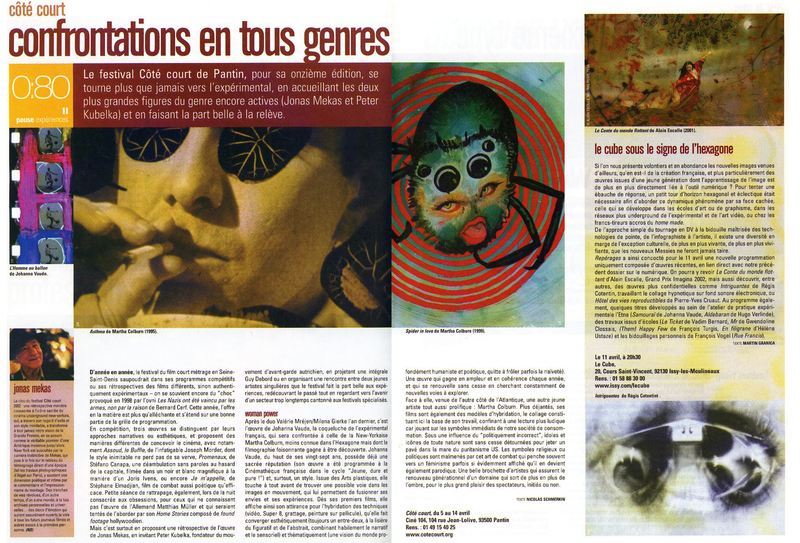 The dash of the heart » by Agathe Dreyfus in the catalogue of « 11 # festival of film runs to the Seine Saint Denis », France, 2002, p. 74 – 77.